Defence Minister Nirmala Sitharaman on Monday met the fishermen families affected by cyclone Ockhi at Vizhinjam, Thiruvananthapuram. The Defence Minister assured them that the search and rescue operations are being conducted with full force. "The search and rescue operations by the Indian Navy, Coastguard and Air Force will continue with full vigour," she said. 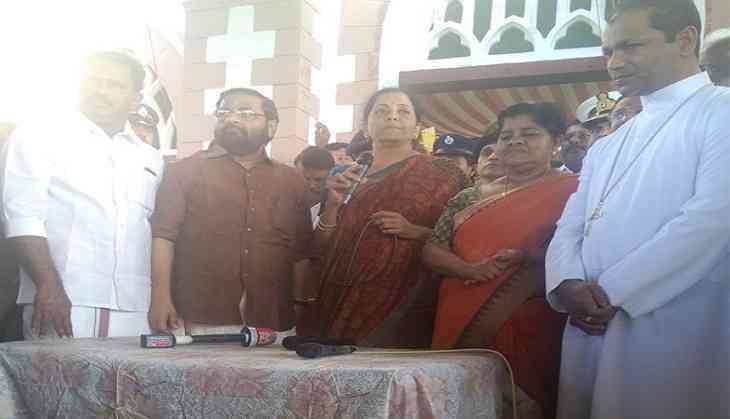 Sitharaman reached Kanyakumari on Sunday to take stock of the situation in the wake of the cyclonic storm, which has tormented the coastal areas of Tamil Nadu and Kerala and now Lakshadweep islands. She informed that, so far, 357 fishermen, including 71 from Tamil Nadu, who had been stranded in sea due to Cyclone Ockhi, have been rescued. Earlier on November 2, the Tamil Nadu authorities stated that the total number of deaths caused due to cyclone Ockhi has reached 19. The state department also said that at least 690 people have been rescued so far, while 96 were still missing. It further stated that 63 people have been hospitalized, while 74 houses have been fully damaged and 1,122 houses have been partially damaged. The deadly cyclone, which has claimed many lives, lashed the coastal areas of Tamil Nadu and Kerala on Saturday with torrential rainfall and gusty winds.